I first used the concept of “cooperative leadership” in developing and implementing supplementary courses and programmes at the University of Helsinki in the beginning of 1990’s. I adopted the use of the concept of insight in concentrating on the philosophy of cooperative learning and applying it to the development of a learning organization. 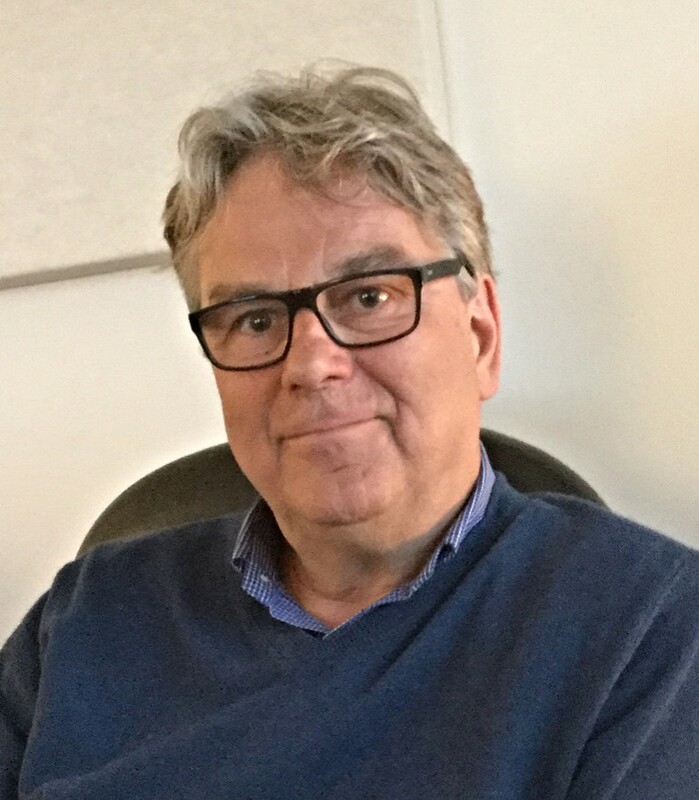 I had an excellent opportunity to get acquainted with the theme, since beginning from 1989 I was leading three-year principal and leader training programmes at the University of Helsinki with the Finnish entrepeneur of cooperative learning philosophy, Viljo Kohonen. He had been first introduced to the theme during his one-year commission as a guest researcher at the University of California in Santa Cruz, USA. Pretty soon after we started our work, our Finnish team grew with Doctor of Pedagogics Pasi Sahlberg. We not only wrote and trained together, but above all got collegially acquainted with what cooperative learning was all about. We acquired information by bringing experts of the field from all over the world to Finland to train us, and later by being trained in different countries. David and Roger Johnson were the first to come to Finland, teaching in Lahti and Vantaa. They also returned to train us more extensively. We were also able to lure other top-notch trainers to Finland. Each on their own turn, we had, among others, Elisabeth Cohen, Bruce Joyce, Shlomo and Yael Sharan, Hanna Shachar, and Nancy Schniedewind. We also had the opportunity to get introduced to the philosophies of Spencer Kagan and Robert E. Slavin in different conferences. Thus the basis for the philosophy of cooperative learning which I adopted, was the result of influences from many quarters along the years. I have been exploring and opening these principles in my books and articles (including Kohonen & Leppilampi, 1994; Sahlberg & Leppilampi, 1994; Leppilampi & Piekkari, 2001; Leppilampi, 2002). The greatest challenge with this article is to reflect on the presented principles from the point of view of cooperative leadership. I had the initial insight towards this direction in the beginning of the1990’s, when I was teaching the train of thought of learning organizations and the building of well-working teams to leadership and staff of different work communities. My perception was that the principles of cooperative learning suited these goals perfectly. At its best, cooperation is the social construction supporting individual learning becoming increasingly independent and free. In a learning organization, social change is pursued by learning together, helping one another and learning from one another. Sincerety, dynamics, group discussions, and shared processing are the predominant characteristics of a learning organization. The growth and process of becoming more and more independent individually go hand in hand with social growth and independence. Succesful endeavours in a group support individual independence. A philosophy of cooperative learning designed to aid individual learning is the basis for the renovation of leadership. I will now take a look at leadership from the point of view of the principles of cooperative learning. My aim is to clarify the connection of the principles to the development of a learning organization. Positive interdependence is not an easy and straight-forward concept. I perceive it as a sort of boosting of “we-spirit”. Even the most talented worker can not be succesful in an organization without the help of others. This is a matter of creating a common “will-space”, in which everyone feels both needed and that she needs others to achieve a common goal. Everyone feels they are “in the same boat”. The success of a group is dependent on the success of each of its members and the success of a member affects the success of others. Positive reciprocal interdependence works as the nucleus of cooperative leadership. Members of a group have to perceive on a emotional level that the group is interconnected, and that mutual success is in favour of every member. In a situation like this, they have the motivation to work together and coordinate their effort to perform a task. As thorough acquaintance as possible, setting of common goals, and foundation of common rules create a good basis on which to build reciprocal dependency. It is a matter of “laying the first stones” for the beginning of a shared process of development. Another important principle in cooperative leadership is face-to-face promotive interaction. Here, strong, cooperatively driven leadership rises to the epicenter. This is about building structures that “force” people to work together. A good leader models face-to-face promotive interaction, with a goal of creating a culture of “genuine encounters” in the community. She masters dialogue, knows how to encourage the staff in expressions, gestures, and words. She also knows how to tackle even hard issues constructively. A good starting point for the creation of face-to-face promotive interaction culture is the leader’s own example in encountering an employee. The next principle of cooperative leadership is individual accountability/personal responsibility for work effort, learning at work and development for oneself as well as for others. The goal of such leadership is that employees learn to take responsibility for the work task of their own group and to help other members of the group perform as well as possible. One means for the increase of individual accountability is to have a rule, according to which everyone has to be able to introduce the functions of her own group or department to a visitor. Individual accountability is realized, when every member of the group is responsible for the success of her group and takes care of her own share as good as possible. In meetings and planning groups, everyone has to be able to tell what was discussed, and how the group reached their conclusion. What comes to the function of the group, everyone is conscious of its basic mission, roles, responsibility, power, rules, objects of development and so on. The group will not host “hitchhikers” (nor will it host “beasts of burden”). Instead, every member brings their own constructive effort into the group. Individual accountability is the key to success, but responsibility for other members of the group (supporting, social enhancement, empowerment, caring for others, and playing by mutual rules and norms) will ensure a positive change in attitudes and behaviour, a good atmosphere and the best possible result of work. The concept of individual accountability is deepened by Hellsten’s (2001) concept of positive individualism, which is built by positive interdependence and community-mindedness described before. Positive individualism rises when a person gets to be seen and heard as herself and her needs are met, or when a person gets recognition, respect and attention. In a situation like this, the person learns to respect herself, to accept her feelings and to take care of her needs. She also knows how to set herself in the other person’s shoes in interactive situations. Negative individualism, weeded out by cooperative leadership and positive interdependence, on the other hand, is manifested by a person only seeing others as what they can offer her, or how they could be of benefit to her. She thinks everything through herself and can not afford to give anything to others. The continuing practise of social skills is an important part in creating a learning team organization. The history of Finnish work culture can not be described as being too interactive. Thus, a mindset of a work environment with the leadership steering the work and telling the employees what to do is deeply rooted in us. In recent years it has been a clear trend to try to enhance interaction, but the culture is slow to adjust. The assumption that “employees do not want to take a stand, even though they are offered a possibility to do so” is clearly false. The issue has more to do with how they are taken in to the discussion. Endless number of times I have heard the leadership asking “Any questions?” after a numbing strategy or budget review. After a long monologue, no one is eager to lengthen an already lengthy meeting with new questions. Another reason for the silence is that no one is willing to make a comment due to fear of embarassement. The same phenomenon can be seen at organizations’ training events. A certain way to get the staff discussing is to use “chatter groups”. The simple rule: “for a moment talk with your neighbour about what you just heard, what you did not understand or what you do not agree on”, is enough to spark a conversation in any situation. This is preferably preceeded by an agreement that “everyone is willing to report” what was discussed in groups. According to my experience, at first this procedure might feel frightening to some people. But when everyone has taken a turn, the fear little by little eases and it is naturally replaced by interaction. A genuine and interactive encounter of members of a work community is the dream state of any cooperative leader. The greatest challenges have to do with skills the leadership and the staff have for managing difficult matters and conflicts. A superior with a low self-esteem and poor interaction skills usually deals with difficult matters in an aggressive manner, using power-bound means of oppression and rule. Such use of power can also be found in the interaction of employees. An under-estimating, ridiculing and mocking behaviour, that with time even develops into bullying, is another extremely poor way of dealing with difficult situations. The most desirable way to tackle difficult matters is one that includes genuine listening and respect of others. It is equal and sets its goal on a common solution. In certain situations, communication is also required to be assertative and conscious of own rights, but also at the same time considering and listening. Using the I-message (the discusser tells what she thinks and needs, and how she feels) along with fact-based observations (not interpretations!) has proved to be an especially efficient way to get the counterpart genuinely into the discussion. In such a case it is characteristic to the process that everyone has a possibility to share her feelings and to test her own ideas. In genuine interaction, the discussers also know how to listen and to check that they understood correctly what they just heard. The management of a work community is always in the focus, when an organization is trying to learn social skills. Employees have to be consciously taught to, among other things, work as parts of a group as well as to be able to run one, mutual trust and respect, equality, attentive listening, negotiation and decision-making skills, and how to survive conflicts. It is the task of the leadership to act as an example of desirable conduct in different situations. The same is also true when an organization is learning how to give positive feedback, encouragement and support. What would be more rewarding to a work community than to get a “positive feedback virus” spreading? Group prosessin is an increasingly popular way to develope a cooperative, learning organization. Shared reflection creates a brigde from personal experiences to new theories, concepts, models and procedures. Another dimension of reflection is to learn how to consciously observe how one’s own team, group and organization works. These kind of metaskills, and at the same time the development of cooperation skills, can be trained for exaple with the following questions: What happened, and why? What did the operation feel like? Where did we succeed, where we failed? How can we improve our work methods in the future? Shared assessment (i.e. assessment together) makes us able to utilize learning from our own experiences in future work assignments and projects. The goal is that employees would recognize both strengths and points to develop in their own actions. It is sensible to make group agreements concerning personal development issues to endorse a conscious watch over them, as well as a continuous process of learning. It is difficult to overemphasize the importance of the role of shared reflection in the creation of a learning organization. The assessment of experiences in learning also develops the metacognitive skills of an employee. After all, knowing yourself properly is the key to adopting and learning new things, as well as to improved work efficiency. Familiarizing and applying the aforementioned principles to cooperative leadership is the requirement for the birth of cooperative culture in a work community. A good cooperative leader’s professional expertise is not measured in how many different management theories and procedures he/she knows, but rather in can he/she pick the right approach for each management situation. Every meeting of an individual or a group is a new challenge, in which success is dependent of how well the leader is prepared for the encounter, how well her emotional intelligence works and how well she knows how to steer a process of interaction. The philosophy of cooperative learning and leadership works extremely well with the theory/model of experiential learning (Kohonen & Leppilampi 1994; Leppilampi & Piekkari 2001). 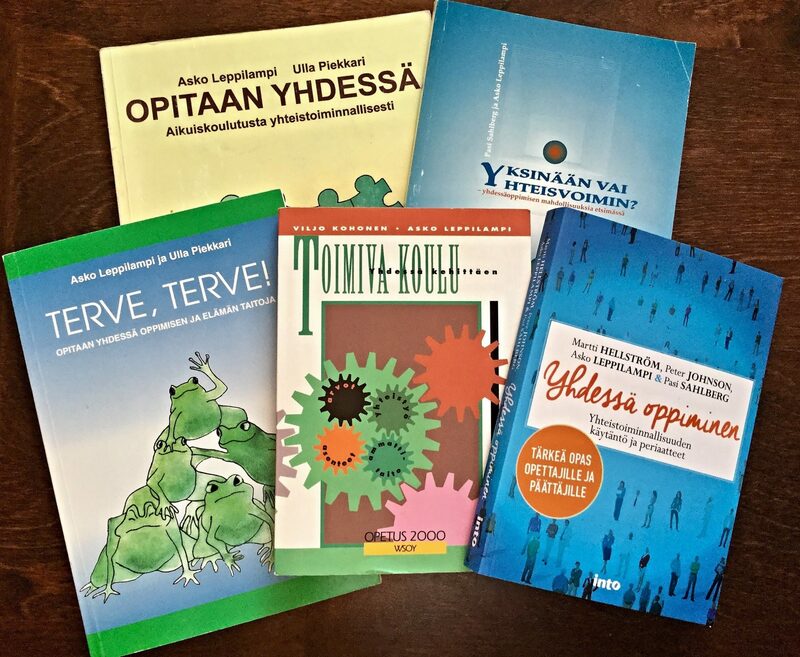 To connect and model these theories (Leppilampi & Piekkari 2001) has been my contiuous aim in my own work as an instructor. I will now try to portray my thoughts on how this model, originally developed for the teaching process, also works in cooperative leadership. According to the idea of constructive learning, an independent, thinking person is most commited to the improvement of herself and her work when she is allowed to choose her own development goals and define the means how to pursue them. According to the experience-based learning theory, a person is most motivated if she feels she can influence all the stages of a process that concern her, from planning to acting out and even to assessment. A grown person knows how to reflect (=critically assessing thinking) on her own actions even amidst everyday work and pressures. Such a person uderstands the importance of experience in learning. From her “metastage”, she knows how to look back in time; to learn from triumphs and cmistakes. Genuine reflection is an extremely demanding skill, that requires constant practise. This portrays a challenge for leadership and collegiality. A cooperative leader guides her staff “walking alongside” each one of them, asking catalytic, thought-provoking questions, and shows a genuine interest in the needs of her employees. A leader who is interested in the learning of her staff is also a humble listener, who dares to confess her own weaknesses, to reveal where she is vulnerable, and above all her willingness to learn from others. With such leadership, the staff also dares to take risks and even to fail without the fear of guilt. The organization is defined by a culture of mutual support and growth, in which reflection, supporting others and respect has become an everyday routine. Everyone develops herself, tries new things, encourages and supports others to try even when everything doesn’t go as planned. The difference between a well-working organization and a normal one is then not in what is done, but rather in how conflicts are handled. The background thought being that development always starts from a well handled conflict. When the development of a work community is under discussion, the aforementioned train of thought also works well for the growth of a group and the entire staff. Nowadays, it is agreed that a permanent change in the culture of a work community can not be attained by rules from above. The staff works obidiently for a while, but with time opposition will spread fast. This results in back talk and opposition of leadership, which then results as a gradual breakdown of the organizational culture to unofficial groups that in a worst case scenario end up competing and at war with each other. In a situation like this, the clicking and the opposition of the leadership’s actions are inevitable facts that hinder the way the entire organization functions. The “iceberg model” introduced by French and Bell (1975) describes how the development of an unbroken organizational culture is endorsed with cooperative leadership. 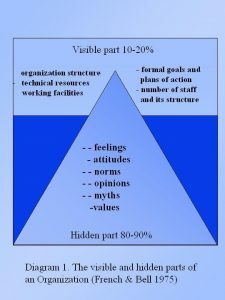 The visual tip of the iceberg, the “official” part, is often required in creating the management’s long-term vision and goals, the functional structures and resources. A good leader has a clear picture of the direction and the goals, but she also masters the means to reach them with the staff. Refining one’s own thought at the same time listening to the staff is a part of cooperative leadership. This kind of leadership does not however mean endless and time-consuming discussions. A cooperative, strong leader knows when things have been discussed enough and the needed information made available. When it is time for decision-making, she shows her stern character by firmly guiding the group towards the majority’s view, or in a tight situation even against the popular opinion. This kind of action is justified, especially when the leadership has truly heard the staff, but regardless of it makes an independent decision believing it to be the best solution for the organization. In a situation like this, the leader has to observe that she alone is responsible for the cosequences of her decision. The core message of the iceberg-model is that in an organization’s process of change, we must also take the hidden part in consideration. Change in the real culture of a work community is best attained by making the staff a part of all the stages of the process of change, and by leading the process skillfully. For instance, in a proper “footing process” of a strategy, the staff is an active part in debating the community’s values, norms, goals, procedures, rules, ways to solve conflict situations, and so on. A good process takes the innate know-how of the organization in consideration, as well as the “silent knowledge”, and puts great value to emotional intelligence as a part of successful development. The iceberg model is realized in managing change according to, for instance, the model givel in diagram 2. Through genuine encounters and mutually respectful dialogue (interaction in discussion, genuine listening and critical, evaluating discussion), the parts are able to create different solution models (divergence stage). After this, they agree on the development issues and the means that they will use to achieve these goals (convergence stage). Usually a brainstorming process of this kind will produce an immense array of possibilities, out of which many will be feasible. The most common mistake is to start too many development processes at the same time. Therefore good leadership has an ability to prioritize together with all the parties involved. Hargreaves et al. (1989) describe the stages of a good development process in their model (see also Hämäläinen et al. 1993, and Kohonen & Leppilampi 1994). In diagram 2 that model is presented in relation to the sphere of experiential learning (in a circle inside the formation, see Kolb 1984). A development process should start, according to the model of experiential learning, with a thorough reflection of where one is and where one should be, based on each employee’s own experiences. In this divergence stage different cooperative techniques (meetings to map problems, questionaire, open discussion, guided cooperative process, etc.) are used to define the condition of the community or group at the moment. During the process, the community’s strengths and development issues are examined in relation to the approved strategy. Everyday practices, agreed rules, flow of communication, relationship of everyday values to official values, mapping of learning, etc. can also be under reflection. The most important thing is that the staff feels that if the process succeeds, it could result to be benefitial to their work, endurance, and relationships. After a status check, an evaluation of the situation, follows the convergence stage, where the issues to be developed are agreed, as well as with their order (the staff develops an own theory/model of how to proceed). What makes the model so useful is that based on it, for example a one-year plan can be formulated for the organization. It is important to agree a schedule for each target of development, i.e. when it is estimated to be on a level in which the organization can move on to the next development issue. As part of the plan, each target of development is appointed with responsible members, defined with the criteria for mutual success (i.e. how to define that the process really proceeds and the goal is really reached) and agreed follow-up. In cooperative leadership, a part of the beginning of a development process is a stage where everyone chooses their favourite project out of the 4-5 most important mutually agreed projects. The main thing is that everyone is a member in at least one development group. The idea of progress for a process is that the realization (the testing stage for experiential learning) and assessment (reflection) go hand in hand at all times. In practise this means assessments in the middle of the process, and reporting among all active members. Continuous assessment is an especially important instrument of cooperative leadership. With it, the staff is imposed with suitable “pressure”, without forgetting support, when the process is about to wither or when the skill and resources are about to run out. A leader can never leave the staff on their own, instead she always has to know where the community is going. With the criteria for success defined in the beginning stages of a chosen project and continuously redefined along it, it is made sure that the process continues and that the staff is kept motivated. Without documented, broad, concrete goals, the beginning situation is often forgotten. As a result, it is easy to feel that no progress is made. To boost endurance and an even more efficient process for the next chosen development target, a shared assessment of what has already been accomplished is absolutely imperative. After the assessment, conclusions are made of what has been learned and how experiences and observations can be made of use in the future. This “rising to the meta stage” develops the organizations ability to survive future processes. In this stage of the development process, the first circle of the sphere of experiential learning is completed. The next round is started immediately after the previous one ends. At this stage, the staff has already gained new experiences, new knowledge and skill, that is to say that “the organization has learned”. The fact that responsible individuals and schedule for the following process were agreed at the very beginning of the planning process is significant for the work needed for a new development target. The people, who a couple of months before were handed tasks to continue on the next development target, have subconsciously worked on their theme the whole time. The selective attention of an individual has been fixed on a development target that she has been an active part in picking. Due to this, they have noticed if they have come across an article, a book, a TV program, or a random discussion concerning the matter. The employee responsible for the development target will collect the article, will write a note of what she heard, utilizes what she read in her own work, etc. She is working on the subject matter, even though the target of development might not be exactly relevant at the moment. Thus the group has already acquainted itself to the matter better than the rest and will be ready to take responsibility of leading the development process. However, the responsible group itself will not do all the work needed for the project, but rather delegates and shares tasks so that the agreed commission get done. According to my observations and the discussions I’ve had in training situations, the greatest loss of time for any organization are badly planned conferences and meetings. Conferences start irregulary with part of the people arriving to the conference room late. Poorly planned things take up everyone’s time, enormous amount of time is devoted to announcements, only a few people speak, the discussion jumps from subject to subject, people talk on the phone during the meeting, people leave in the middle, the subject matters do not involve everyone present,… The list could go on forever. Creating cooperative structures and culture starts with cooperative meetings and conferences. A well-managed and run conference serves as a miniature model of cooperative working for the whole organization. An efficient conference is the basis of any well-functioning organization. In diagram 3, a model of structure is given for a cooperative conference. It concentrates not so much on technical issues of a conference, but rather its aim is to involve everyone in the meeting, genuinely and eagerly. In a cooperative conference everyone has a real possibility to take part in each stage of the meeting, including preparation of each part. A practise, in which the involved people are lured to the spot before the official part of the meeting with coffee or other refreshments, has proved itself practical. Free chatter helps to distance from other oblications and to orientate on the meeting, which will start exacly when agreed. The choice of location and seating play an important role in a cooperative conference; the choice implicates the structures of cooperative leadership. It is usual that meetings are held in the same space time after time, even so that the same people always sit on the same seats. The renovation of such physical structures starts naturally by taking this familiar practise openly under discussion. A meeting can start with a shared debate on “why we sit here, in this formation”, actualized in pairs. After a few minute’s discussion, the leader randomly asks what conclusions the pairs have reached. After a shared discussion, a decision is made to test new places for a meeting and to explore the signifigance of location in the success of a meeting. The functions become more effective when chairs are placed in a form of a circle and tables removed, especially in the case of discussion-based meetings and idea-throwing sessions. And after all, who stands in the way of holding meetings, especially small group planning sessions, out, in the garden for instance? In a situation like this, some of the paired discussions can be realized as a short stroll with a note book to write down ideas. In the end it is important to examine the new methods, that is to say that the pros and cons of the experience should be defined together. Before going through the protocol, it is worthwhile to check the schedules of the participants and to agree when the meeting is over. By doing this, it is made sure that all the matters are handled uninterruptedly, with no one leaving the meeting before the session has ended. On the other hand, a together set schedule will usually result to a resolution of all matters on the agenda. Every one is conscious that an additional meeting is necessary, or that the issues have to be moved to the next meeting’s agenda, if some of the points are left unresolved. It is imperative to keep the set ending time. Defining common goals is very important for commitment. In a well-prepared meeting, the agenda has been delivered to the participants well before the meeting. An included proposition for a decision, presented by the preparation group, added in the agenda helps especially in the case of difficult matters (see “planning continuation” later). As a result, hallway discussions known in many organizations are moved to the days prior to the meeting and everyone enters the session well-prepared. If the agenda is not delivered on before hand, it is worthwhile to give the participants 2-3 minutes to go through the points on the agenda at the beginning of the session. After this the chairman of the meeting quickly asks the pairs for their opinion on which points should be prioritized. It has proved to be a good practise to divide the issues on the agenda to three: issues to be annouced, issues to be decided and issues to be discussed. The announcement part is made quicker by writing everything down on the agenda, and going through only the most important and question-provoking announcements together. The function of discussion issues is to prepare for the next meeting and possibly to agree on the people who will prepare the agenda for the next meeting. In this context, cooperativity links with the principle of equality, in that each member of the group will get a turn to be responsible for the preparations. In developing practises for meetings, it is good to agree on a set of rules for a meeting. In my work, I have had to deal with a lot of complaints concerning situations where everyone does not participate actively in a meeting. The fact that someone does not utter an opinion in a meeting does not mean that she would not have one. The community is used to just a portion of people discussing (usually the leadership and a couple of actives) while others remain mainly silent. Other defects often occuring include, for instance, that the meeting doesn’t stick to the point, gets tangled in one subject for too long, doesn’t listen to everyone’s opinion equally or doesn’t make clear decisions. Bringing these defects to daylight requires open discussion, in which everyone’s experiences from previous meetings are collected using paired chatters. It is advisable to use enough time on this. A list of development issues for meeting practises is created on the basis of gained material. These issues are then systematically improved. Using small group discussions and paired chatters to go through the most difficult matters on the actual agenda has proved to be extremely effective. After the proposal for decision, each group is given a minute or two to formulate an opinion of the proposal, with the “everyone is ready to report” principle in mind. After this, for example, the leader asks each group to pick an alphabet, A, B or C for each member. Then the leader announces that, let’s say , member B of each group should prepare to present the group’s opinion. In most cases, this makes sure that even the opposing opinion get stated. No one is forced to talk in their own name, instead she can say “we were thinking with A and C here, that…” This procedure ties everyone firmly to the process, as everyone has to be able to explain the group’s stand on the matter. Positive mutual dependency and the principle of individual accountability are realized rather tangibly. A group chatter, or functions alike, might take a bit longer than “ordinary” process, but in most cases it is worthwhile, just to get the matters handled properly and definitively agreed. In the assessment stage, discussions are once again held using paired chatters; how well did we meet the goals set, how well did we succeed to work together, did we play by the agreed rules, etc. This stage will take about 5 minutes, but experience has shown that the time used here will come back later in spared time and more effective meetings. It is worthwhile even to mark assessment on the agenda, to make sure that it is done. The goal of the assessment stage is to find means to improve future meeting practises, so with this in mind conclusions and agreements are taken down. The question of who will be chairman and secretary in the future should be discussed when speculating improvements for meeting practises. Apractise of rotative order, changing people on these seats, has proved to be quite interesting. This practise frees the official leader of the group to observe the participants’ activities from a different point of view. Sometimes it is important in terms of leadership even not to take part in the discussion at all (or to enter only when decisions are made), but to observe the culture of decision making, general atmosphere of the meeting, and so on. Planning continuation has showed itself, along with assessment, to be the most neglected part of meetings. A general practise is that the schedule and location of the next meeting are settled, but other issues are left on the chairman’s responsibility. A very effective way to improve meetings is to have a discussion in the end concerning the issues that will be on the agenda for the next meeting. At the same time, the people in charge for each issue are agreed. This procedure links members of the group more firmly to the issues. It is also characteristic to the cooperative spirit that everyone has a possibility to influence which issue she takes part in preparing. Good manners require functioning by the principle of equality and observation, in which notes are made of when each member has taken part in preparations. 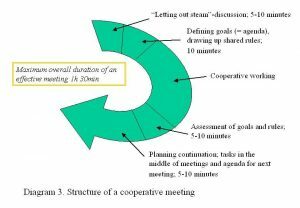 The aforementioned “good meeting practise” is a firm step towards cooperative culture, be it concerning the development of an organization or, let’s say, political decision-making. In many work communities the practise has been to have the model introduced in diagram 3 placed on the walls or the table of the meeting room to remind of the common course of action. At the same time, it has been agreed by the management that each of its members will use the same model in all conferences and meetings they attend to. When this is continued for a year for example, the mindset of a cooperative meeting will start to spread to all conferences, meetings and disussions within the organization. By this, the basis is laid for even wider cooperative functions. Cooperative leadership is a management practise among others. There are occasions when an authoritarian, strict, goal-directed take is needed. Sometimes, luckily very seldom, even raised voice is needed to “wake” an employee to reality. On the other hand, when one wants to improve the social skills of the staff and to raise everyone’s self-esteem, authority and aggression will not work, and cooperativity is needed. It is important to use a variety of management practises and to remember that a leader who is zealous, professional, genuinely listening and works according to the official values, is always needed. My journey to the philosophy of cooperative learning and leadership, within the past 15 years, has been a very important process in my personal growth. In my “past life” as a coach for teachers I had thought and acted according to doctrines I had received in the 1970’s. Looking back now from a distance, I have to conclude that unlearning the adopted was extremely difficult. The role change from a teacher to the instructor, supporter and creator of cooperative structures, as it is understood in constructive learning theories, has been a long process. Even though one understands the cooperative philosophy in theory, it is easy to forget internalizing it to be a part of all training. I assume that I was able to live more by the philosophy as a head master, after I realized that I could not manage without the support, responsibility and participation of the community. Reflecting on my experiences, it feels easy to understand the immense task managers have in trying to renovate the culture of their work community to cooperative direction. I am convinced that individual change starts with a conflict in one’s own thinking. One of the most important tasks of a manager is to evoke that conflict with the help of catalytic questions and an own model for operations. To inflict a genuine will-state, she must get everyone to understand their own requirement for change. My experiences of training and management based on cooperative philosophy are very encouraging. In pursuing for profound change in the manners and basic assumptions adopted by the staff, we continuously bump into new challenges. Most of the time the challenges are due to the trainees and employees not being used to voice their opinions in a large group, or to use power and take responsibility in their own work. When an employee has learned to work in a culture, in which the leader orders and tells what to do, it is hard for her to learn to function in a cooperative culture, in which everyone has a possibility to make decisions and to choose one’s own way of working. One of the greatest challenges with delegating a task, from the manager’s point of view, is that teaching something new to an employee usually eats up a lot of time from both the manager and the employee. The superior often has a tendency to fall in the “I’ll do it myself” trap. This in turn means that the leader loses the time spared by delegating a task and that the employee loses a chance to learn a new, interesting challenge. This kind of learning requires patience from both parties. A direct result of this train of thought is that there has to be continuous discussion and agreement concerning the values that drive an organization. At the same time, it is good to create rules for constructive conflict management, agree on a permission to fail and to accept forgiveness as part of the organizational culture. In this case forgiveness means abstaining from judgment. An organization where failures are interpreted as part of development and not as something to be afraid of, is usually a creative, succesful community. The people in such organization are eager to learn from both successes and mistakes: the organization explores together what factors constituted to an outcome and agrees how to function in similar situations in the future, based on this experience. Working in an organization, in which reflection has become an everyday routine, is pleasant and everyone feels well. Value discussions, that have proved important for development and success, have become more frequent in the last decade. Debates like this are used, not only in work communities, but almost everywhere where people strive for a common goal. A good example is my current hometown, Lahti, where decision-makers and hundreds of people had already managed to meet three times before May of 2004 to discuss the value foundation upon which decisions are based. Among the lecturers for the first seminar was philosopher Maija-Riitta Ollila. A local newspaper (Etelä-Suomen Sanomat 29.1.2004) highlighted “generosity” and “greed control” from her theses. According to Ollila, futurologists have agreed that “generosity is one of the values of the future. Knowledge is benefitial, when your friend has it too. Then it can also be developed.” This is a good basis for cooperative, interactive leadership, for if generosity reigns, knowledge is not kept from others within the organization. Positive experiences, gained from benchmarking and networking, enforce the significance of this value. The other future value raised by Ollila, “greed control,” is explained by the increased amount of daily choices we have to make. “When life is nothing but choices, we no longer have time for anything else. We are always running elsewhere, filling life with new choices. We need to choose less”, Ollila concludes. This also applies to everyday work. In agreeing development targets and deciding how to proceed, we often choose too many things too fast. In reality, our values drive our choices, and haste is the offspring of wrong choices. Are we unable to decide what is important to us, even though after all everyone has time for what they consider important? This is why we need the work community development model portrayed in diagram 2—to make choices, agree on responsibilities and schedules according to it. Grounds for increasing cooperativity is also surprisingly found in human well-being. According to Markku T. Hyyppä (2002) solidarity improves the well-being of the population. He has, in his research of the Swedish-speaking population of the Finnish coastal regions, come to the conclusion that they live longer and are healthier and more alert than other Finnish people. According to Hyyppä, it is important to build social capital, that is based on the interaction, participation, community-mindedness and shared trust among people. It is a question of the way of encountering others and living with them, with the pursuit of trying to help, trust and do something for the common good. An interactive network, or social capital, can not be stored nor collected for a rainy day. Instead it is born out of common activities and shared trust, and disappears in the lack of these features. Hyyppä compares a community of this sort to Moomin Valley. Peace, trust-based interaction, compassion—and peaceful pace—reign, even though there’s all sorts things happening all the time. People work together and separately, but find each other when needed. Even though the community is seemingly closed and situated in a valley, its inhabitants travel out, return, and when visitors come there, they’re immediately accepted. This kind of Moomin Valley is a permissive community. I think the questions here are largely about the same things as in the philosophy of cooperative leadership: social skills, open interaction, equal dialogue and constructive dealing of conflict situations. These factors are the basis for trust, and through trust also for the birth of a well-managed work community. In this article I have attempted to find both ethical and value grounds for cooperative leadership and growing into it. As a result we have an ideal of leadership, which would need almost inhuman functioning to succeed. Each leader is naturally responsible for their own growth, which has its basis in one’s own thinking and action. A leader first has to learn to operate in the way he would like the whole organization to function. She has to learn how to meet, listen, humble, support, wonder and be constructively critical. This also has to do with knowing yourself. Hellsten claims, that “a human being finds her identity in finding her own weaknesses. A humble person knows who she is—she affords to listen?.” Humility is strength that does not deny weaknesses. It is a realistic characteristic that has its background in experiences of dealing with failure and weakness, and acknowledging them. The reward of humility is that a person learns to see her own limited scope. The beginning of strength is thus in weakness. Weakness also creates love. Through love, we can eventually reason, what in the end is lasting and valuable in life. (Hellsten 2001.) Caring and loving are thus also in the center of growing to be a strong cooperative leader. On the other hand, caring and intimacy are born out of open encountering of others and truthfullness, in which even weaknesses are out in the open. Wisdom and personal growth are more about questions and wondering, than about answers. This train of thought is in concordance with the creation of a learning cooperative organization. We need each other’s help to grow. To Hellsten (2001), a good leader is also a hero. To him, one who has the ability to listen to her own inner voice and to act according to it is a hero, even though the community doeasn’t necessarily agree with it. She makes her decisions based on her inner visions and commits to them so strongly that they begin to become real and she gets others to follow her in her pursuit. Being a hero is also daring to confess one’s own vulnerability and failures. A good leader lets the staff to be the hero from time to time. Hellsten bravely concludes that true loyality to an employer is to provide the work community with crises it needs for growth. The challenge is in whether the management and rest of the staff are able to face them and can they solve the raised problems. Other heroic features are both daring to raise up difficult matters to discussion and daring to hush of matters one has already discussed about. You hear more by giving space to others than by talking. And after all, it is the opinion of others that the leader needs to back up a decision. Cooperative leader, genuinely after her staff’s interests, realizes that rush and the frenzy of working drive our actions. A strong leader dares to step out of this rush when it is sensible to the endurance of the leader herself and the whole work community to guide others to make choices that are in favour of the community’s values. At worst an employee makes work-related decisions against her own values, which results to reduced job satisfaction, diminished zeal and, as an end result, fatigue. It is argued that we don’t get exhausted due to a heavy work load, but due to unmeaningful, monotonous work that goes against her own ideology. This again offers a challenge to a leader; how to get everyone to feel themselves important and to work on a task they conceive meaningful. A cooperative leader has a clear vision, target and goal, as well as the needs for realizing these objects. To gain these, she has to be able to create a shared will-space with the staff. As a result of this, needs also become shared. Positive interdependence of employees grows, and the satisfaction of one’s own needs steers people to work together. This is when the leader has made herself almost needless in terms of gaining basic goals. The staff is realizing her vision, leaving the leader with time to cultivate her vision, create resources, keep up connections, develope herself and look after the staff. A positive whirlpool has been created—the whole work community develops with the employees and the management supporting each other even in difficult situations. At the same time, the organization functions as if it would have small companies inside it and has its employees working in entrepeneur-like fashion. A cooperative, learning organization, in which every member also dares to take responsibility for shared leadership, is born. French, W. L. and Bell, C. H., 1975. Organisaation kehittäminen. Alkuteos: Organization Development. Suom. Terho Turkki. Tapiola: Weilin & Göös. Goleman, D. 1999. Tunneäly työelämässä. Helsinki: Otava. Hargreaves, D.H. & Hopkins, D. & Leask, M. & Connolly, J. & Robinson, P. 1989. Planning for School Development. Advice to Governors, Headteachers and Teachers. Department of Education, University of Cambridge. Hellsten, T. 2001. Elämän paradoksit. Saat sen mistä luovut. Helsinki: Kirjapaja. Hyyppä, M.T 2002. Elinvoimaa yhteisöstä. Sosiaalinen pääoma ja terveys. PS-kustannus. Hämäläinen, K. & Laukkanen, R. & Mikkola, A. (toim.) 1993. Koulun tuloksellisuuden arviointi. Opetus ja Kasvatus-sarja. Helsinki: VAPK-kustannus. Johnson, D. & Johnson, R. 1989. Leading the Cooperative School. Edina, Minnesota: Interaction Book Company. Johnson, D. & Johnson, R. & Johnson Holubec, E. 1990. Circles of Learning. Edina, Minnesota: Interaction Book Company. Kohonen, V. & Leppilampi, A. 1994. Toimiva koulu. Opetus 2000. Porvoo-Helsinki-Juva: WSOY. Kolb, D. 1984. Experiential Learning. Experience as the Source of Learning and Development. Englewood Cliffs: Prentice-Hall, Inc.
Leppilampi, A. & Piekkari, U. 1998. Terve, terve! Opitaan yhdessä oppimisen ja elämän taitoja. Kukkila: Salpausselän Kirjapaino. Leppilampi, A. & Piekkari, U. 2001, 3.painos. Opitaan yhdessä. Aikuiskoulutusta yhteistoiminnallisesti. Pori: Asko Leppilampi Oy ja PRO koulutus ja konsultointi. Leppilampi, A. 2002. Yhteistoiminnallinen oppiminen aikuiskoulutuksessa. Teoksessa Sahlberg, P. & Sharan, S. (toim.) Yhteistoiminnallisen oppimisen käsikirja. Porvoo: WS Bookwell Oy. Sahlberg, P. & Leppilampi, A. 1994.Yksinään vai yhteisvoimin? Yhdessäoppimisen mahdollisuuksia etsimässä. Helsinki: Helsingin yliopisto. Vantaan täydennyskoulutuslaitos. Sharan, S. (toim. ), 1994. Handbook of cooperative learning methods. Lontoo: Greenwood Press.